John McDonald, who heads RSU 13, responds with praise for his administrators, teachers, staff and the district's communities, which include Rockland, Thomaston, Owls Head, South Thomaston and Cushing. ROCKLAND — John McDonald, who led the Rockland area school district’s transition from a turmoiled-filled system to one that has seen a renaissance in both programs and buildings, has been named Maine’s 2019 superintendent of the year. The Maine School Superintendents Association announced the honor Wednesday at its fall conference at the Augusta Civic Center. Eileen King, the executive director of the association, said in the award letter that McDonald was well deserving of the recognition. “I couldn’t be happier for you. I know what you took on, and I’ve watched you quietly make decisions that are best for your students, staff, and schools,” King said. McDonald’s honor was also praised by Regional School Unit 13 Board Chair Loren Andrews. “I think we all know why John was chosen — his inspiring leadership, compassion, and commitment. He has led us so capably, with strength and vision, and we all know how much he deserves this award and recognition. We are so incredibly lucky to have him, and he leads an equally wonderful staff. Let’s celebrate this one, because it’s a great recognition for our district, as well,” Andrews said. McDonald issued a statement after the award was made. “I am humbled to receive this honor for I stand in mighty company with the excellent leadership of Maine schools. Every superintendent knows that success cannot be achieved alone and that leadership does not reside in one person. I am privileged to work with a team of fantastic administrators, a dedicated, professional teaching and support staff, a very supported and committed school board and wonderful community partners. We have all joined together in creating the Schools of Our Future, and I accept this award for the entire school community. I look forward to many more years of serving our communities and our schools,” McDonald said. 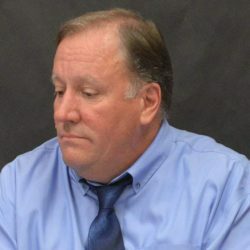 McDonald was hired in July 2014 by the RSU 13 board, which had previously suffered through years of turnover – not only of superintendents but of other administrators and board members. The board at the time was also mired in frequent bickering. McDonald had been assistant superintendent in Belfast from 2009 until his hiring by RSU 13. He had been director of curriculum and instruction from 2007 through 2009, and prior to that, he was assistant principal at the Troy A. Howard Middle School in Belfast. He also had been principal of the Morse Memorial School in Brooks. The Schools of Our Future included new programs, an emphasis on restorative justice, and construction of new schools and additions. Programs have included a freshmen academy and fishermen’s academy. Construction projects include the new Ash Point Community School in Owls Head, and additions and renovations to Oceanside Middle School in Thomaston, and Oceanside High School in Rockland. RSU 13 includes Rockland, Thomaston, Owls Head, South Thomaston and Cushing.